LUCY BURDETTE: Our daughter and son-in-law visited Turkey this fall and look at what they brought back to us: samples of one of my favorite desserts, baklava. Isn't that the best gift ever? Those tasty nuggets inspired me to try making it--again. Chop the walnuts and pistachios finely in a food processor and then add the sugar and cinnamon and pulse to combine these. Set this aside. Remove the phyllo dough from the package and unroll it on a clean counter. Butter a 13 x 9" baking dish and layer in 8 of the phyllo sheets, one at a time, buttering each sheet with a pastry brush dipped in the melted butter. 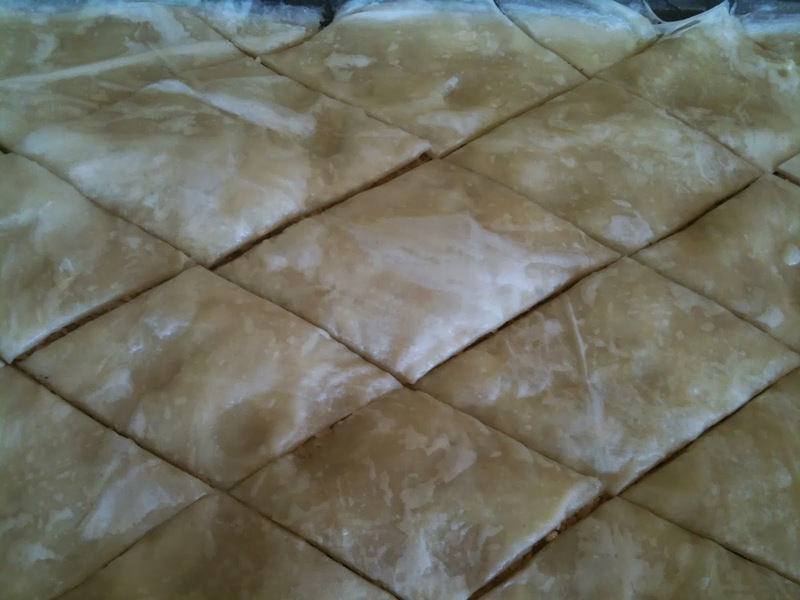 Pour 1 cup of the nut mixture over the eight layers of phyllo and spread this evenly to the edges. Continue to layer eight more sheets of dough, painting each with melted butter. Spread another cup of the nut mixture over the top. 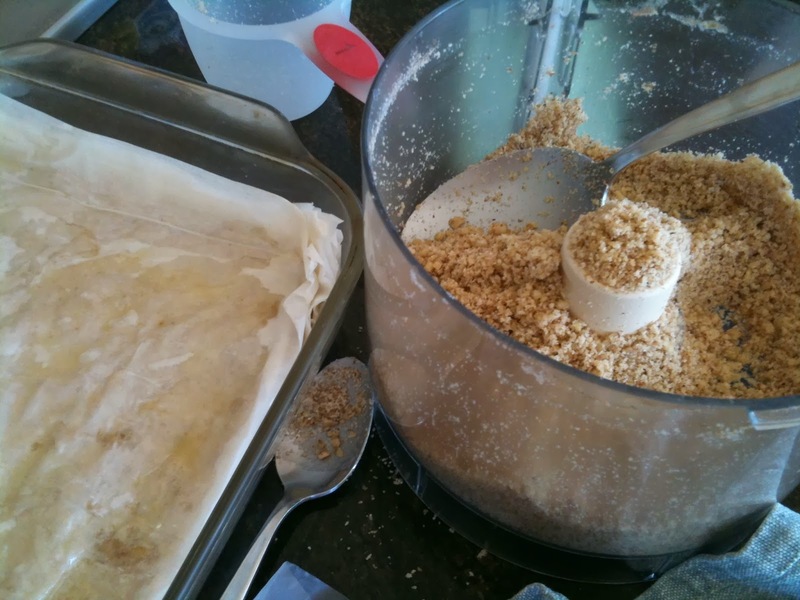 Repeat the layers and the nut mixture until all the nuts are used, ending with phyllo. With a sharp knife, cut the baklava into diamond shapes. Bake at 325° for 45 minutes or until golden. Let cool and sit for six hours or overnight, then serve at room temperature, well wrapped. Oh the agony of waiting! But it's worth it. My guests told me this was the best baklava they had ever eaten. My hub and I had to agree. These little squares could make a splendid addition to a Christmas cookie platter! 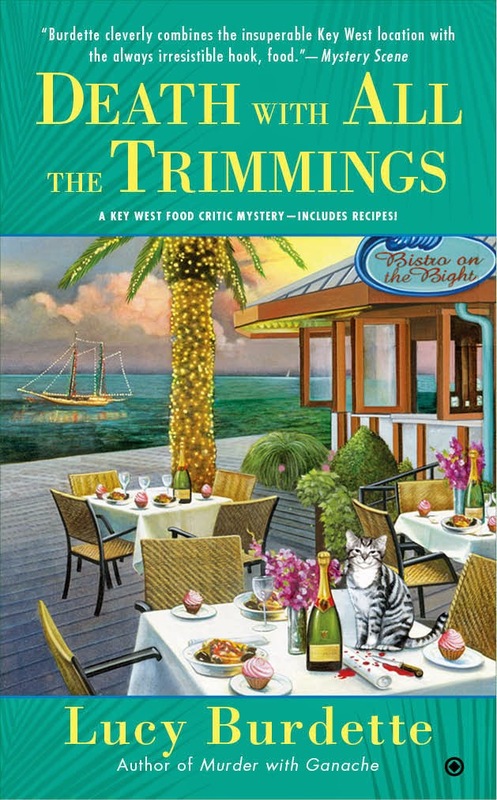 Question: How is a good mystery like a piece of baklava? DEATH WITH ALL THE TRIMMINGS is here in time for Christmas stockings! I am so glad you posted this recipe. I love Baklava but was always scared to try it. You make it sound so easy. I will be giving this a try. YUM!!!! My son and his family are currently living in Turkey and have become quite spoiled with the delicious desserts (and food) there. The many dishes served at breakfast make my mouth water!! I usually buy my baklava at an ethnic bakery, but may have to give it a try now that you showed us how to make it. As far as the pastry brush goes......one Christmas I made a lovely cake in a bundt pan which was then to be brushed all over with a syrup. It was picture perfect, until I lifted the cake plate up to admire it and could see that the cake was covered with bristles from my (cheap) pastry brush!!!! Been using silicone brushes every since. That trip to Turkey must have been amazing--and delicious. What a lovely gift from your daughter and SIL--and for us with your recipe share. Thanks, Lucy/Roberta, have a great week! One of those desserts that seems like a work of art. Thanks for sharing! "Question: How is a good mystery like a piece of baklava? With some characters that are flaky! My comment disappeared so I'll try again: I'm so happy you posted this today, Lucy/Roberta, as I've recently read Diana Abu-Jaber's memoir THE LANGUAGE OF BAKLAVA, and ever since then I've had baklava on the brain. Your blog and wonderful photos gave me the incentive to try making your version of this wonderful treat ASAP! Many thanks.